In this lesson, we will learn how to find the value of the nth term in an arithmetic sequence and how to find a term's order given its value. 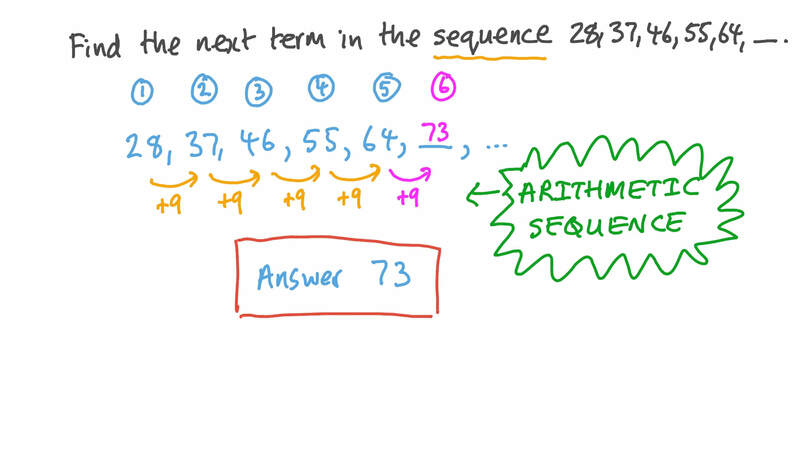 Find the next term in the sequence 2 8 , 3 7 , 4 6 , 5 5 , 6 4 , . Find the first term of an arithmetic sequence whose common difference is − 1 2 , where 𝑇 = − 5 4 0 4 9 . Find the order of the term whose value is 112 in the sequence ( 1 7 , 2 2 , 2 7 , 3 2 , … ) . Karim has a physics exam where he earns 4 points for each question that he answers correctly. In the table, represents the number of questions that he answers correctly, and represents the total number of points that he scores. Suppose he scored a total of 60 points on his physics exam. How many questions did he answer correctly? On the first day, a person exercised for 26 minutes. After that, they increased the time they exercised by two minutes each day. On which day did they exercise for half an hour? Find 𝑇 5 0 , given the arithmetic sequence 𝑇 = 7 𝑛 − 1 𝑛 . Find the order and value of the first term which is greater than 190 in the arithmetic sequence ( − 2 5 , − 1 7 , − 9 , … ) , where 𝑛 ≥ 1 . Find the tenth term from the end of the arithmetic sequence ( − 1 5 , − 2 2 , − 2 9 , … , − 2 6 0 ) . Find the value of 𝑛 in an arithmetic sequence whose first term is 12, given that 𝑇 = 1 8 7 𝑛 and 𝑇 = 3 6 9 2 𝑛 . Find 𝑇 4 5 , given the arithmetic sequence ( 1 8 , 2 6 , 3 4 , … , 6 9 8 ) , where 𝑛 ≥ 1 . An arithmetic sequence has 11 terms. Which is the middle term? Find the common difference and first term of an arithmetic sequence given the tenth term is 25 and the fifteenth term is 40. AThe common difference is 3, and the first term is − 2 . BThe common difference is 3, and the first term is 1. CThe common difference is 13, and the first term is 11. DThe common difference is 3, and the first term is 55. EThe common difference is 15, and the first term is 25. Find the number of terms in the arithmetic sequence ( − 4 , 2 , 8 , … , 3 9 2 ) . Find the number of positive terms in the arithmetic sequence ( 8 7 , 8 0 , 7 3 , ⋯ ) . Find the order of the term whose value is 115 given the second term of an arithmetic sequence is − 2 0 , and the fifth term is 7. Find the order of the term − 2 in the arithmetic sequence  − 1 6 , − 1 3 , − 1 2 , ⋯  . Find 𝑇 1 9 in the arithmetic sequence ( 1 2 𝑎 + 9 𝑏 , 1 6 𝑎 + 1 3 𝑏 , 2 0 𝑎 + 1 7 𝑏 , … ) . Find the value of 𝑛 given 𝑇 𝑛 + 2 from the arithmetic sequence ( − 4 6 , − 3 7 , − 2 8 , … ) equals 𝑇 7 𝑛 − 9 from the arithmetic sequence ( 9 , 1 0 , 1 1 , … ) . The arithmetic sequence is such that and . What is ? Find 𝑥 and the number of terms in the sequence 4 − 1 8 𝑥 , − 3 0 𝑥 − 7 , … , − 2 2 𝑥 + 1 7 , − 2 9 𝑥 + 1 1 . Find the base of the arithmetic sequence given the general term 𝑇 = − 3 𝑛 − 1 𝑛 . Find the arithmetic sequence given 𝑇 = − 6 8 5 and 𝑇 = − 6 2 7 . Then find the order and the value of the first term that exceeds 64. Complete the formula for the 𝑛 t h term in an arithmetic sequence: 𝑇 = 𝑎 + 𝑛 . Find the values of 𝑥 and 𝑦 given the last term of the arithmetic sequence ( − 1 8 , 𝑥 , … , 𝑦 , 1 3 0 ) is 13 times the eighth term. Suppose that 𝑎 = 5 5 and 𝑎 = 3 7 belong to an arithmetic sequence. What is 𝑎 1 ?